This Sky & Telescope "Hot Product" is designed to produce the largest true field possible in a 1.25" eyepiece. (Its 27mm field stop is the same as the 32mm Tele Vue Plossl). The higher power darkens the sky background while the greater magnification yields more details on extended objects. Further, its light weight (1/2 lb. 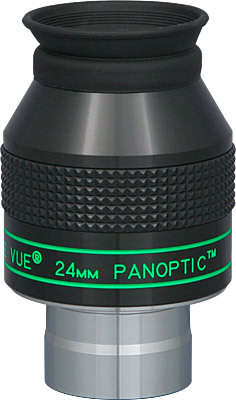 ), comfortable 15mm eye relief, and tapered top instantly make the 24mm Panoptic the ideal eyepiece for getting the maximum field for binocular viewers. Barrel Size (in.) - 1å_"